This week I’ve struggled a bit with something that is on my mind. I realized it when for the third time in two days I found myself having an argument in my head with the person that I am upset with. It’s happened at random times. While doing dishes; while driving. I’m starting to feel like it’s almost to the point where it is too late to discuss it because I’m not sure that I can anymore without getting too upset. Of course I could always do so via email but that isn’t really the right way to handle this. So I’m hoping I find some patience. Patience to find the right words and the strength to address this issue appropriately. Quickly and to the point without making it about more than it needs to be. I so hope I can. While writing this I decided to look up some quotes on patience. I thought maybe they would inspire me. Help me to breathe and relax and think again about what is upsetting me. Below is a quote I came across that I really like. Do you have a favorite quote related to patience? How do you de-stress so that you can prepare yourself to deal with something difficult? 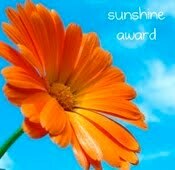 Last week I was surprised to find out that Lori over at mommyfriend shared a couple awards that she received with me! Then a day or two later LizAnn at forgirlsanddolls gave me one of the awards as well! Really? Me?!? Thank you both so very much! 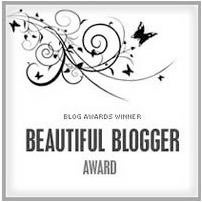 I am new to blogging so this was a surprise to me and I feel so blessed to know that you both find value here at aplaceforthoughts.com. I appreciate it more than you know! From what I understand once you receive these awards you need to pass them along to 7 other blogs that you would like to share with others and you have to share 7 things about yourself. 1) forgirlsanddolls – love this site! LizAnn shares some very valuable information with her readers and she herself is a doll! Thank you for all of your support, LizAnn! 2) heartbeatnews – Amber Smith is a journalist from my neck of the woods. This is a site in which she is trying to spread the word on cardiac health – SO VERY IMPORTANT! 3) mommyfriend – Lori is so hilarious! Her blog is entertaining to say the least and most importantly she has shown me a tremendous amount of support since I’ve joined the land of bloggers. Thank you! 4) thecookinglady – Angela has some very good recipes! If this site isn’t marked in your favorites yet – it should be! 5) thelittlethings – Julie found me here and afterwards I had to go see her site and now I visit it regularly. I was so touched to have someone come by that I hadn’t reached out to! Thank you, Julie! 6) thesahmproject – Pretty soon another little one will be arriving for this mom! Her blog is great and she shares how she has prepared to be a SAHM! 7) walkingtheland – Jessica – you are the first person that I “met” when I entered this blogging world and I so appreciate the friendship you have shown me. Your blog is great! You are a fabulous mother and teacher. The little ones that spend their days with you are so very blessed. Thank you so much for the support you’ve shown me. I’d like you all to know that I just love to visit your sites and catch up on what is new with you. Thank you, thank you, thank you for the support you’ve shown me and for continuing to visit aplaceforthoughts.com time and time again. Stop what you are doing. If you can. I know we always think we can’t because there is just too much to do but… stop! Close your eyes. Listen. What do you hear? If you hear a very small hum from your computer (like I am now!) then you are going to want to walk into another room. Walk outside if you can’t find the right spot indoors to do this (yes, even if it’s cold – put on that coat and scarf and head outside for just five minutes). Take a minute to breathe for you. Let go of your stress. Think of something pleasant. Or don’t even think. Just be. Give yourself a moment to rejuvenate somehow. Inhale and exhale. Take time to do this each day. I know I’m not always good at letting myself slip away from everything else each day but I know that it is important. I’m writing this as a reminder that I need this and to remind others that it is okay to do something for you! It’s good and important for our health! This quote is so special to me. I was a single, teenage mom, but pushed through my Bachelor’s degree, never taking my eyes off the dream. I’m now nearly done with my Master’s in Counseling, am married to a wonderful man, and have the most amazing 7 year old daughter in the world.